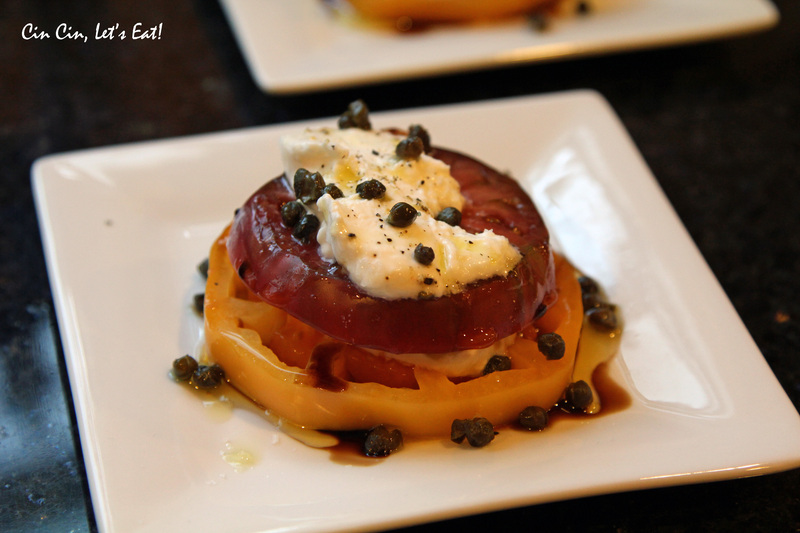 Heirloom Tomato Stack with Burrata and Fried Capers [recipe] – Cin Cin, Let's Eat! Yes, I’m still sticking with the farewell to Summer theme here. Beautiful heirloom tomatoes are all over the farmers market right now but not for long, so I gotta enjoy them while they last! A couple weeks ago, I had a fabulous meal consists of small bites at James Randall in Los Gatos, California. There were boneless fried chicken with bacon waffle, gnocchi with pancetta in garlic cream, charcuterie plate, and this amazing heirloom tomato stack with burrata cheese and fried capers. It made such an impression, I knew I must recreate it. This dish tastes ridiculously yummy, looks impressive, and almost no cooking involved except for the fried capers. Try it on a week night and you’ll instantly feel like you’re at a fine dining establishment and forget about all of that stress from work, or try it at your next party and impress all of your guests. A simple dish like this requires top quality ingredients so be sure to use all the good stuff! 2. Repeat step 1, once or twice depending if you want two or three tiers. Have some baguette or any crusty bread on hand. You’re going to want to have something to sop up all that delicious sauce after you eat the tomato and the cheese. *If the burrata cheese you purchased comes in a tub of water, be sure to drain it first and pat dry so the liquid doesn’t run all over the tomato slices. *I prefer fried capers more than regular capers. Fried capers aren’t as tangy and take on a more savory quality, they complement the dish very well without the overwhelming briny taste. Pingback: Tomato Salad with Burrata and Nectarine [recipe] | Cin Cin, Let's Eat!